This is the standard of measure of all the women in the book Headstrong by Rachel Swaby. In this work, Swaby covers the lives and contributions of 52 women in varying branches of science including invention, physics, mathematics, biology, chemistry, and more. Why 52? 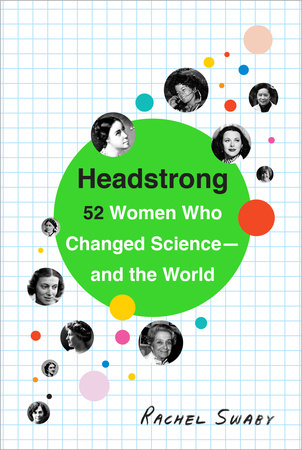 Swaby reasons that there are 52 weeks in a year, and so in reading this book you can learn about a different female scientist each week. Each selection is just a snapshot of their life and their lasting impact to human progress and innovation. Some of these portraits are only two pages long; the longest is only about 5 pages. Although each segment is brief, the value of having so many different contributions by women compiled together effectively drives home the point of the impact women have made to the umbrella of science area which they fall under and upon the larger world. The work is fact-filled, interesting, full of trivia, and delivers strong evidence of the value of female scientists without harping on or getting lost in hot-button issues like male dominance in science and exclusion of women in the field. The book deals in facts, and these include the struggles women had to go to in obtaining education and standing in their passions within fields where they were the glaring minority. My favorite profiles included those of Gerty Radnitz Cori, a Biochemistry scientist responsible for our understanding of glycogen; Virginia Apgar, who developed a test to establish newborn health standards; Marry Anning, a pioneer in paleontology and fossil discovery; Tilly Edinger, a Jewish woman who encountered Nazi targeting in establishing paleoneurology; Rachel Carson, the voice behind environmental awareness and author of “Silent Spring”; Rosalind Franklin, whom developed a structure of DNA that was “borrowed” by Watson and Crick; Hedy Lamarr, an well-known actress who also worked in tandem to invent a system for coded radio waves to aid torpedo navigation during war-time; and household name Florence Nightingale, responsible among many other contributions for her statistics work and suggestions for improved hospital conditions like better lighting and quiet time for recuperation that are still being pursued today. Headstrong was enlightening and kept my interest. I see this being a valuable tool for students in researching these scientists, and grasping the timeline of scientific discovery more fully through human interest stories such as these. For me, this would be a recommended reading for college freshman or AP high-schoolers. The work is well-researched and written, and with such a variety of topics of interest that spurred me to want to know more about each of these women. I would highly-recommend this read to those who love science, history, feminism, and generally just a good read. This entry was posted in Uncategorized and tagged 4StarRead, Biology, blogging for books, BookReview, Chemistry, feminism, Florence Nightingale, Hedy Lamarr, history, Rachel Swaby, Random House, science, women by Erica. Bookmark the permalink.